The Dominica Botanical Garden is located on the west side of Roseau at the foot of Morne Bruce. It is 240 acres andt acts as a tranquil green space for both locals and visitors. The British Crown Government conceived the idea for a botanical garden in 1889. The goal was to ensure a supply of properly propagated seedlings of tropical crops for the island's farmers. Accordingly, a portion of a former sugarcane plantation was purchased for this purpose and planting began in 1890. In addition to growing plants to aid the island's economy, a portion of the property was devoted to ornamental plants. This area was landscaped and embellished with iron gates and a fountain. During Dominica's colonial era, botanists from London's Kew Gardens worked with the Dominica garden. 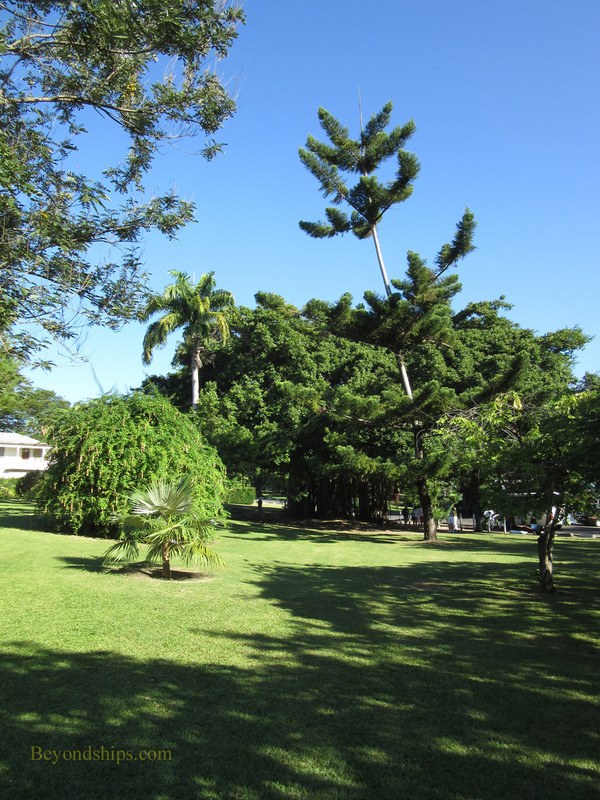 As a result, plants from around the world were brought to the Dominica Botanical Gardens. Some 500 species of plants once grew in the Garden. In 1979, the Gardens were devastated by Hurricane David with 150 mile an hour winds. Much effort has been made to restore the Garden from that disaster. While the Garden remains a pleasing park, visitors should not expect a botanical garden of the caliber of those in London or New York. One of the Garden's most popular attractions, however, dates from the hurricane. It is a bus that was crushed when a Baobab tree fell on it. 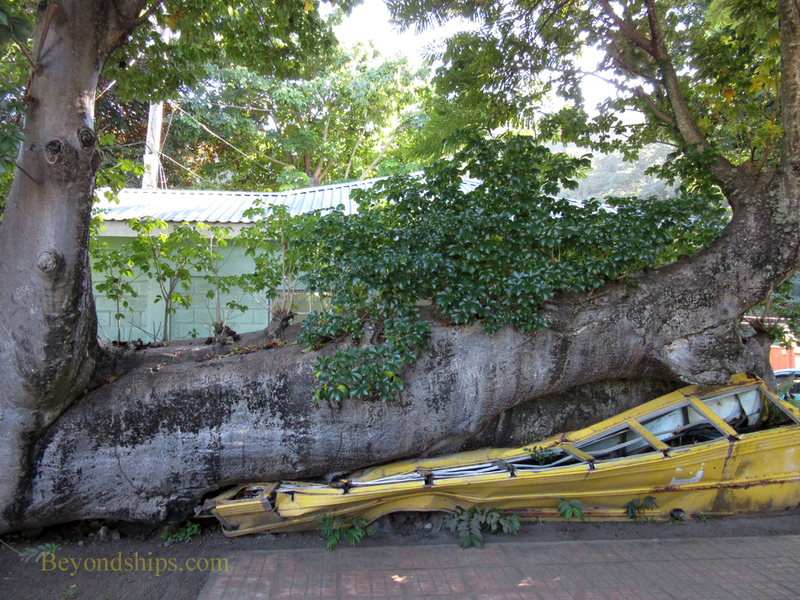 The huge tree remains alive and growing even with the flattened bus under it. Also in the Garden is an aviary that houses Sisserou parrots. 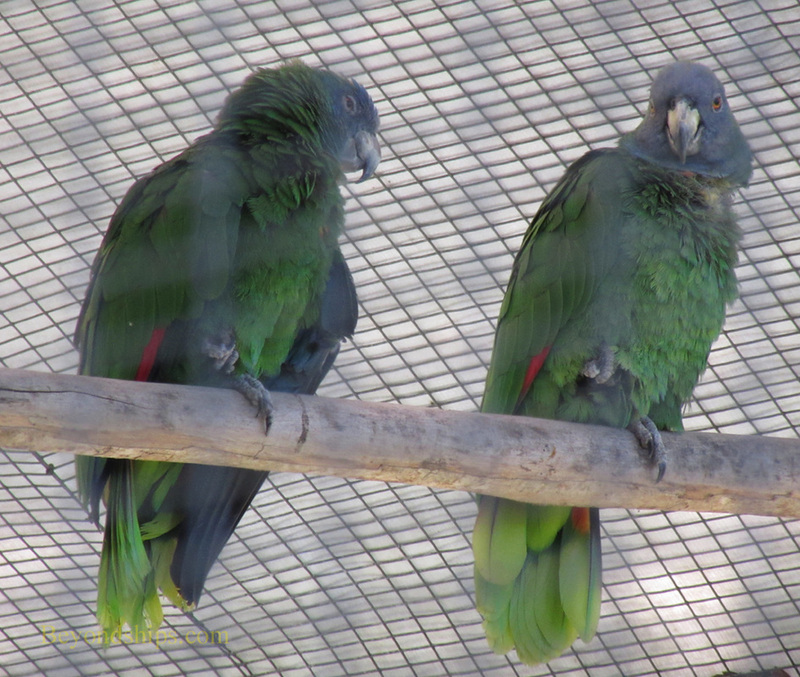 The national bird of Dominica, these parrots are an endangered species. Other exotic birds, including hummingbirds, visit the Gardens regularly. From the Botanical Garden visitors can take Jack's Trail up to the viewpoint on Morne Bruce. It is a steep climb but from the viewpoint there is a panoramic view of Roseau and the adjoining sea. Below: The national bird in the Garden's aviary.